Warhammer Vermintide 2 - Vermintide is back – darker, bloodier and more intense than ever! Join and Win! Vermintide is back – darker, bloodier and more intense than ever! The game is available for ‎$29.99, but the winners of our contest will get it for free. An online coop based game on the lines of Left 4 Dead but in the world of Warhammer. You play with four other human players in coop mode. Warhammer: Vermintide 2 is the sequel to the critically acclaimed Vermintide. The time has arrived to revisit the fierce first-person co-op slaughter-fest featuring visceral and ground-breaking melee action, set in the apocalyptic End Times of the war-ravaged Warhammer Fantasy Battles world. Our 5 heroes from the first game have returned to take on an even greater threat – the combined forces of a malevolent and destructive Chaos army and the swarming Skaven horde. Prepare to be challenged like never before as you and your team desperately try to survive the never-ending onslaught. Choose between 15 different careers, climb the talent trees, customize your arsenal to fit your unique play style, fight your way through a myriad of stunning levels, and challenge yourself in our new Heroic Deeds System. The only thing standing between utter defeat and victory is you and your allies. If you fall - so will the Empire. Reference accessed HERE 17th February 2018. If you have a problem installing or activating or getting Warhammer: Vermintide 2 beta to work, please visit the problems section over in the Game Discussion forums, which I've now incorporated into the FAQ's thread, and which you can find HERE or check the Steam forums or contact Steam support. Warhammer: The End Times – Vermintide reminded us just how much we missed Left 4 Dead, then gave us a melee-focused fantasy version to make us feel better. Now Fatshark are attempting to make an even better sequel. How are they planning to improve it? Drop the clumsy “The End Times” part of the title and add Chaos. That should do it. Our Warhammer: Vermintide 2 interview with Martin Wahlund and Mats Andersson! Warhammer Vermintide and Strange Brigade Devs Explain Why There Aren't More Left 4 Dead Games! I had a choice of two characters – Kerillian the Elf, previously a Waywatcher but now a Shade (and presumably a Dark Elf), and human Markus Kruber, previously the stuffy Empire Solder and now a Knight. Kerillian has a long spear, does extra damage from behind, and has a Stealth power ‘Infiltrate’. Markus has a huge hammer, the passive ability to gain health when close to death, and a lovely Charge move to send those Skaven flying. In the absence of my favourite Witch Hunter, Markus is the one for me. We arrived on the outskirts of Ussingen, an extremely badly-off town that’s just been raided by the forces of Chaos and Skaven. Yes, in Vermintide 2 the big twist is that the two backstabbing forces of darkness in the Warhammer universe have teamed up. They hate each other, but they hate you more. In the midst of a few burning caravans we found some Chaos warriors, and I realized I also had an auto-rifle. I gunned a couple down and discovered that these horned swine’s were far tougher than the usual Skaven cannon fodder, so had to switch to my giant hammer very quickly. Squishing a few brains in their own helmets never gets old. Then they starting pouring on us from all angles growling “scream for mercy” and the hammer got twice as much work. If I had one complaint about the whole experience, which I’ll mention now (and apart from it only being single-player), it’s that the graphics look kind of washed out. It might just be this particular map, or the early build, but no matter how good the game generally looked, and it does look good, it was always very difficult to tell who was a member of my team and who was a Chaos Warrior. Multiple times I’d think I’d killed everyone, my team would be standing around and I’d go “hang on, don’t I only have three team members?” And then would get attacked by the “extra” party member. Combined the Skaven and Chaos make for a potent – and, most importantly, original – combination. Vermintide 1 was, perhaps justifiably, criticized for looking and feeling just like Valve’s Left 4 Dead. This was most noticeable with the Skaven enemies since for the most part all the rats fell into the same classes as the Infected in L4D – the Rat Ogre was the Tank, Packmaster was the Jockey, Gutter Runners were Hunters, etc. With the introduction of Chaos suddenly Vermintide has a lot more variety. Giant armoured Chaos Knights barred the entrance to Ussingen, slowly advancing but powerful and could take a lot of punishment. Fat, shuffling poison-spewing Priests stayed out of combat but got in the way. Then we have the terrifying Spawn of Chaos that ended the level in a boss fight, a giant, pulsating mass of flesh and tentacles that can pick up allies (and you) and even eat them (and you)! Never saw anything like that in Left 4 Dead, I can tell you. In general the experience of Vermintide 2 is exactly as you’d expect if you’ve played the first game, or Left 4 Dead. You and three others (AI or, preferably, human) make your way through a town besieged by Skaven and Chaos troops and you have to kill them, take out the occasional swarm of opponents or special enemies that come your way, scavenge for items like Healing Draughts, Bombs or Potions, and survive. Two major things have changed from Vermintide 1, as far as I can see. Character Classes have been revamped and you can customize classes a lot more now, which I didn’t get to try out but both Kerillian and Markus played differently to how they did in the last game. Secondly, the introduction of the armies of Chaos adds much-needed variety and distances the Vermintide series even further from Left 4 Dead – while still keeping the addictive gameplay intact. Edited reference accessed HERE. Originally posted by Chris J Capel. Edited and reposted by Whiterabbit-uk 2017 17th February 2018. You can see several videos of game play (from the beta release, unfortunately I've not had time to change the videos to post-release vids) HERE, HERE, HERE, HERE, HERE and HERE. If you loved the Left 4 Dead series, and the Warhammer series and love playing cooperative online games with friends, this is definitely a game to buy (if you don't win one of the ten keys on offer). In the meantime, some lucky community members will be able to get a copy of this game via the keys being offered here today. This second in the series is a big improvement on the first release. The graphics are amazing, game play seems more fluid than the first and you get a much better variety of enemies to go up against than the original. 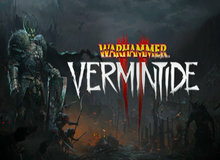 If you're one of the lucky winners of a Steam key for the Warhammer: Vermintide 2 please give some feedback about your opinion of the game, for example, what you liked or disliked about it, or how it could be improved from your point of view. What, improvements, if any, would change your opinion? There are thousands of subscribers to the game giveaway of the day every weekend which makes this an ideal forum for giving developers ideas as to what their consumers (i.e you) would like to see in a game. For example, you could suggest extra content such as better or more original mini games, or a level editor that you would like to see that would make it more appealing to you. Maybe you think the graphics are a little dated and are in need of re skinning, or maybe you've just had enough of the genre and want to see something different or something with more originality? I'd like to take this opportunity to thank the developer Fatshark for providing keys for Warhammer: Vermintide 2 and also to the game giveaway team, as always, for securing other ways to get free games. If todays' game doesn't grab you, but you still hanker for a new game, you'll find details of some game deals whether they be sale items, indie bundles or games being given away for free in the 'Weekly roundup of game deals', HERE (I've not updated in in a while, but most of the links still take you to the latest deals). Whiterabbit-uk, Have you received the key to the full version? Looking forward to the new review! I will be so happy if I win again. I won Warhammer Vermintide here a few days ago. I didn't even know until looking in my email 3 days later lol, thank you guys! Хорошая игра. Меня радует,что есть такие акции. Отличная игра, которую хочется выиграть!